Here you can listen to the sounds of the domestic animals for children. The picture above shows the farm with its various dwellers. To hear the sound of an animal, just click on it with the left mouse button. The audio file will automatically start playing. You can stop playback in the same way. Apart from the main residents of the farm, in the online application you can also find out how a tractor, a tractor driver and a scarecrow sound. Knowledge of what sounds domestic animals produce, what they look like and how they are called, is very important in the overall development of your child. 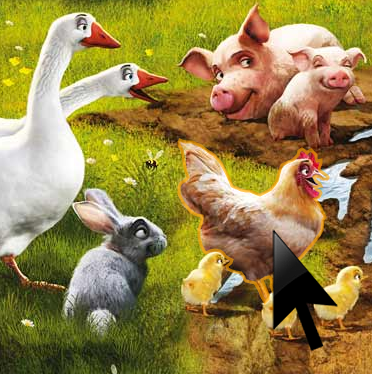 Colourful and bright pictures of the animals attract your kid's attention and help to memorize information. 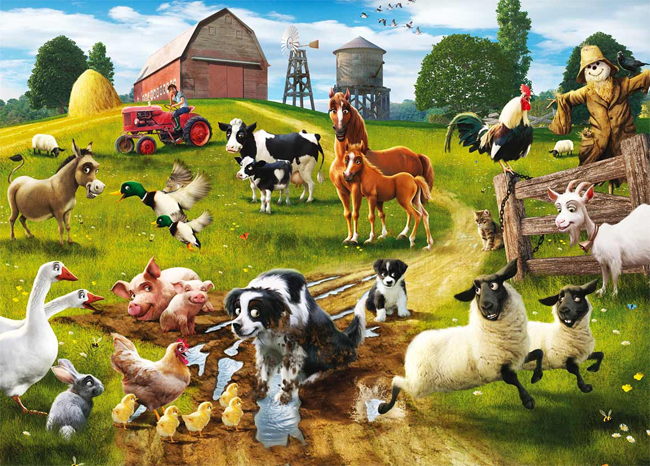 Realistic sounds provide an even more complete picture of the domestic animals. This is not a «quack-quack» from a children's book - here we have collected only real sounds recorded from the real animals on the farms. Geese. Sound: «Gaggle! Gaggle». What it does: cackles, quacks. Rabbit. Sound: «Krkrkr... Krkrkr». What it does: squeaks, drums, snorts. Donkey. Sound: «Eeyore! Eee-aaaah!». What it does: brays, cries. Lamb. Sound: «Baa!». What it does: bleats. Duck and duckling. Sound: «Quack-quack». What they do: quack. Pig. Sound: «Oink-oink». What it does: grunts. Piglet. Sound: «Oink-oink», «Whee!». What it does: snorts, grunts. Hen. Sound: «Kut-kut-kut». What it does: cackles. Chicken. Sound: «Peep! Peep!». What it does: squeaks, clucks. Dog and puppy. Sound «Bow-wow!», «Ar rooff!». What they do: bark. Cow and calf. Sound: «Moo». What they do: moo. Horse and foal. Sound: «Wehee!». What they do: neigh, snort. Kitten. Sound: «Meow, meow». What it does: meows. Rooster. Sound: «Сock-a-doodle-do!». What it does: crows. Goat. Sound: «Naa! Naaa!». What it does: bleats. Bees. Sound: «Bzzzzzz». What they do: buzz, hum. Butterflies. Sound: «Frou... Frou...». What they do: wave their wings, flutter. A wedge of flying geese. Sound: «Gaggle!». What they do: cackle. Scarecrow in the garden. Sound: «Crack... Crack...». What it does: creaks in the wind. Crow. Sound: «Caw! Caw!». What it does: croaks. Tractor. Sound: «Chug chug chug». What it does: rattles, stutters. Tractor driver. Sound: «Ah-ah-ah-ah-ah-ah». What is he doing: he is yelling. Please pay attention!!! Some animals produce loud and sharp sounds that may frighten sensitive children. This is why we strongly recommend parents to listen to the recordings before your kids.